With the Royal Wedding just hours away The Queen today has already conferred a Dukedom on Prince William of Wales. His titles will be Duke of Cambridge, Earl of Strathearn and Baron Carrickfergus. 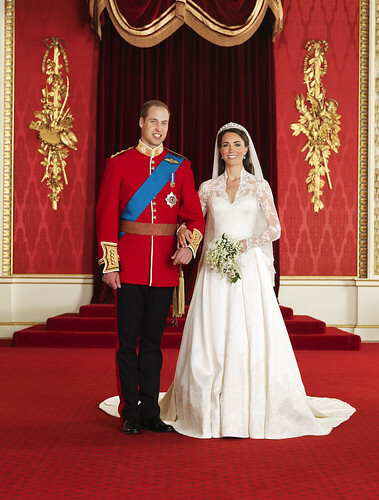 Prince William thus becomes His Royal Highness The Duke of Cambridge and Miss Catherine (Kate) Middleton on marriage will become Her Royal Highness The Duchess of Cambridge. In 1706 George Augustus (subsequently George II) the only son of George Ludwig, Elector of Hanover (subsequently George I of Great Britain) was created with other titles Duke of Cambridge. On the accession of his father to the throne in 1714 he also became Duke of Cornwall and was created Prince of Wales. On his own accession to the throne in 1727 the Dukedom of Cambridge merged with The Crown and ceased. Cambridge was previously a Royal Dukedom and four sons of James, Duke of York (afterwards James II) who died in infancy were all created Duke of Cambridge. As an Earldom Cambridge was a medieval Royal title. Edward IV was Duke of York and Earl of Cambridge till proclaimed King of England in 1461 when his titles merged with The Crown. His father and grandfather both Richard Plantagenet were both Earls of Cambridge and the latter was also Duke of York. Edmund of Langley, 5th son of Edward III and great-grandfather of Edward IV, was created Earl of Cambridge in 1362 and Duke of York in 1385. The Dukedom of Cambridge created in 1801 became extinct on the death of the 2nd Duke of Cambridge in 1904. Cambridge existed as a Marquessate from 1917 when it was conferred on Queen Mary’s brother till 1981 when the 2nd Marquess died and the title became extinct. Strathearn has had Royal connections since Robert Stewart, High Steward of Scotland, was created Earl of Strathearn in 1357. In 1371 he succeeded his Uncle as King of Scotland becoming Robert II and the Earldom merged with The Crown Robert II created his 5th son David, Earl of Strathearn in 1371. Subsequently in 1427 the 6th son of Robert II was created Earl of Strathearn. In 1766 George III’s younger brother Prince Henry Frederick was created Duke of Cumberland and Strathearn. He died without issue in 1790 and in 1799 Queen Victoria’s father was created Duke of Kent and Strathearn. These Dukedoms became extinct on his death in 1820. Finally, Prince Arthur William Patrick Albert, 3rd son of Queen Victoria was created Duke of Connaught and Strathearn in 1874. He died in 1942 and was succeeded by his grandson who died the following year 1943 since when Strathearn as a title has been extinct. An Irish Viscountcy of Chichester of Carrickfergus now held by the Marquess of Donegall was created in 1625 but Carrickfergus alone only existed as a title between 1841 and 1883. The 3rd Marquess of Donegall was created Baron Ennishowen and Carrickfergus, of Ennishowen, co: Donegal and Carrickfergus, co: Antrim. He died in 1883 being succeeded by his brother and the Barony became extinct. Carrickfergus is County Antrim’s oldest town. The word means Rock of Fergus andas an urban settlement it predates Belfast. It is on the north shore of Belfast Lough and is the site of Carrickfergus Castle which dates from circa 1180 and is one of the best preserved Castles in Ireland.